Anna Liber Lewis has been selected from a shortlist of ten of the most exciting emerging artists in the UK to win Griffin Art Prize 2017. The announcement was made at the launch of the Griffin Art Prize Shortlist Exhibition, which is open at Griffin Gallery until 15th December. Now in its sixth year, the Griffin Art Prize has been established as a tastemaker for the next generation of contemporary artists in painting and drawing, and launches the careers of emerging artists by providing the time and financial assistance necessary to develop their artistic practice. The winner receives a £10,000 prize goes towards studio rent, materials from our brands Winsor & Newton, Liquitex and Conté a Paris, and living expenses. Royal College of Art graduate Anna creates vivid, colourful paintings that celebrate female sexuality in the female gaze. She completed her MA in Fine Art Painting at the Royal College of Art in 2015, and has since completed the London Summer Intensive Residency at Slade School of Fine Art. Other artists shortlisted for the prize include: Cristina Banban, Sooyoung Chung, Oli Epp, Jade Fadojutimi, Jonathan Kelly, Anna Liber Lewis, Jinyong Park, Noor Qayyum, Maia Regis, Rania Schoretsaniti. The judges of the Griffin Art Prize 2017 were: artist Ansel Krut, Lindéngruppen owner and chairman, Jenny Lindén Urnes, Griffin Gallery head curator Rebecca Pelly-Fry, and Elephant magazine editor Robert Shore. Alongside prestigious awards for emerging artists such as Bloomberg New Contemporaries, the Griffin Art Prize aims to discover the stars of tomorrow and in the process to highlight the extraordinary calibre of artistic talent in the UK. Zsofia Schweger, 2015 winner, was this year selected as one of Forbes ‘30 Under 30 in Europe’. In 2016, Zsofia was selected for Bloomberg New Contemporaries, won the Jealous Art Prize and exhibited in the Royal Academy Summer Show 2016. She has an upcoming solo exhibition at SAPAR Contemporary in New York. Beatrice Haines, shortlisted in 2012, was one of Artlyst’s ten artists under 30 in 2015 and used her residency at Griffin Gallery in 2016 to create paint using her Uncle’s ashes. Alzbeta Jaresova, 2012 winner, was included in the 2012 Catlin Guide for the 40 most promising UK art graduates, and included in the 2014 Jerwood Prize for drawing. Jack Otway, shortlisted in 2015, was featured at the 2016 XL Catlin Art Guide book launch and at London Art Fair 2016. Jose Carlos Naranjo, shortlisted for the prize in 2015, was shortlisted for the Columbia Threadneedle Prize in the same year. He has since had several solo exhibitions in Spain and group exhibitions in London. Matthew Krishanu, shortlisted in 2014 was featured in Contemporary Drawings from Britain, Xi’an Academy of Fine Arts Gallery, Xi’an Province, China and in 2017 will have work touring with Priseman-Seabrook Collection in China: Cui Zhenkuan Museum; Yantai Art Museum; Artall, Nanjing. Griffin Gallery is committed to supporting the global artistic community and is now firmly established on the London emerging contemporary art scene. 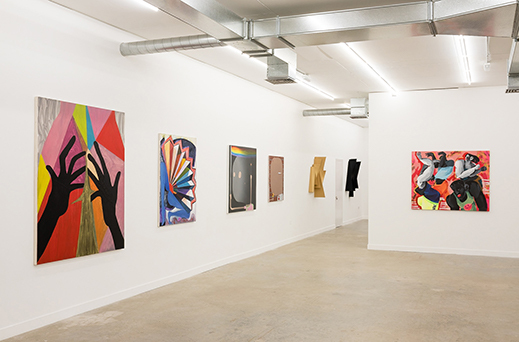 The gallery is not commercially driven but provides a platform for a range of artists, both national and international, from recent graduates to mid-career artists. Their two studios are occupied by a wide range of artists from around the world, with differing concerns and approaches to making. At the centre of their programme is a belief that an engagement with materials is fundamental to the act of creating contemporary art. Griffin Gallery is under the independent Directorship of Becca Pelly-Fry, who is also Head Curator for Colart International.